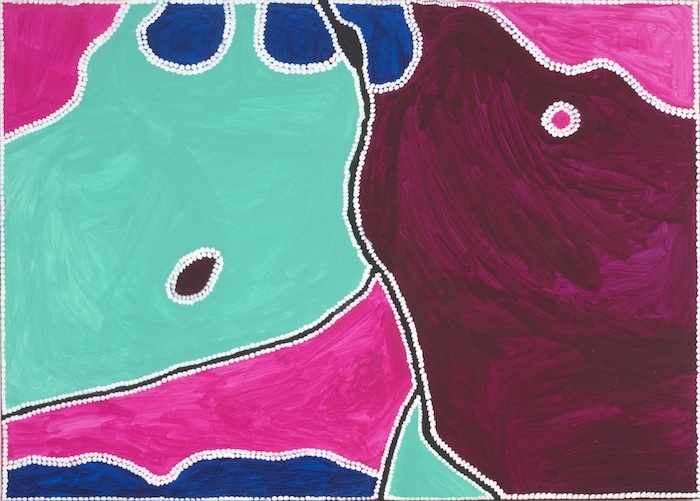 Freddie Timms’ (1945 – 2017) bold and striking paintings are like aerial maps of the country where he was born, lived and worked all his life and after which he was named, Ngarrmaliny. This country includes Police Hole, Bow River and Lissadell and Texas Down stations. His works highlight features of the landscape; black soil, red ground, sandy ground, hills, creeks and water holes as well as the man-made marks of roads, stock yards and homesteads and importantly, Ngarranggarni (Dreaming) places imbued with social and spiritual significance. Much of the country where he worked on Lissadell, a frequent painting subject, is now under the water of Lake Argyle formed by the damming of the Ord River. Mr. Timms’ works are at times deeply political, depicting brutal recent histories of Aboriginal people. This is evident in his work Whitefella – Blackfella, at the National Gallery of Australia. In a large black canvas, four symbolic figures are strategically placed with the ‘whitefella’ at the top, the ‘yellow Chinaman’ under that, then the African, then the ‘blackfella right down at the bottom’. 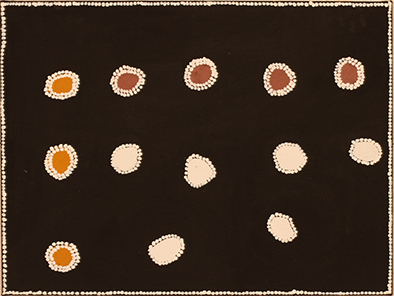 Mr. Timms was involved in developing the early relationship between Indigenous artists and the Australian art market that helped forge stronger and fairer links with galleries and dealers. He was also a central figure in the establishment of Jirrawun Aboriginal Art Corporation in 2000. His work is represented in major collections in Australia and he has exhibited in Germany, Japan, France, USA and New Zealand.